Spotlight: Manchester: Where are the gaps? Greater Manchester’s housing need is 11,254 homes per year, according to the draft Greater Manchester Spatial Framework. A little over a quarter of that need, 3,120 homes per year, is concentrated in Manchester local authority. We’ve seen growing housing delivery in the city recently, but it’s still not enough. Net housing delivery in Manchester was 1,792 homes in 2016-17, a shortfall of over a thousand homes. 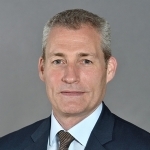 Some commentators have expressed concern that the supply pipeline in Manchester looks full, as there are c.7,000 homes under construction due to complete by 2020. But that supply only addresses just over two years of need. 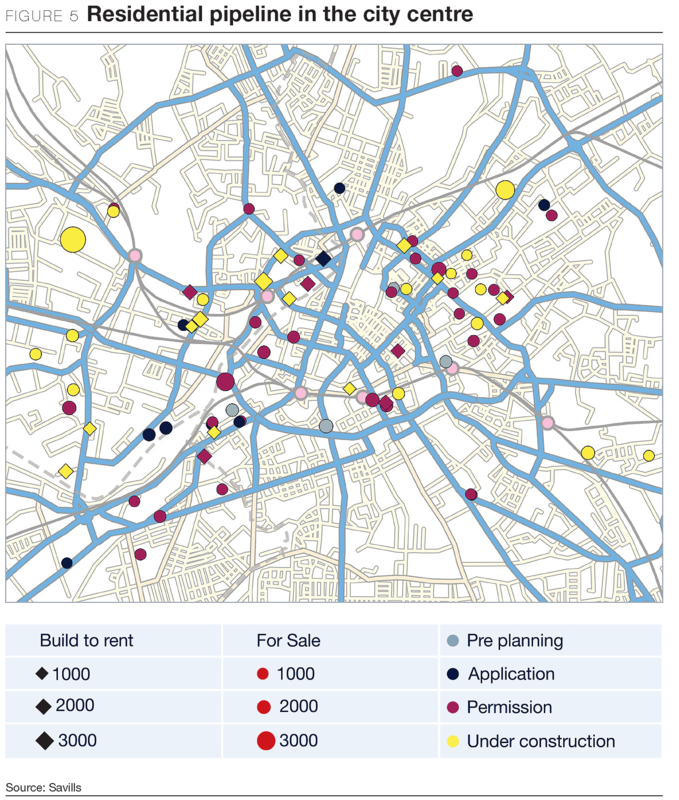 Manchester will need to accelerate this level of development to meet the housing needs of its expanding economy, but across a wider range of price points and housing types meaning areas outside the city centre will need to contribute more. Much of the residential pipeline in Manchester comprises city centre flats, that means future supply needs to be more varied with a recognition that there's a range of different households looking to live in Manchester. This provides a range of development opportunities. Manchester has traditionally taken a very strict view on purpose-built student accommodation (PBSA). But with upcoming changes to planning policy, developers may be able to build PBSA schemes in select zones across the city. Our research has shown that student numbers grow fastest at highly ranked universities, such as the University of Manchester. High quality housing for students and young professionals will help Manchester maintain its high graduate retention rate, boosting the city’s attractiveness to employers. There are also opportunities to help house Manchester’s ageing population. 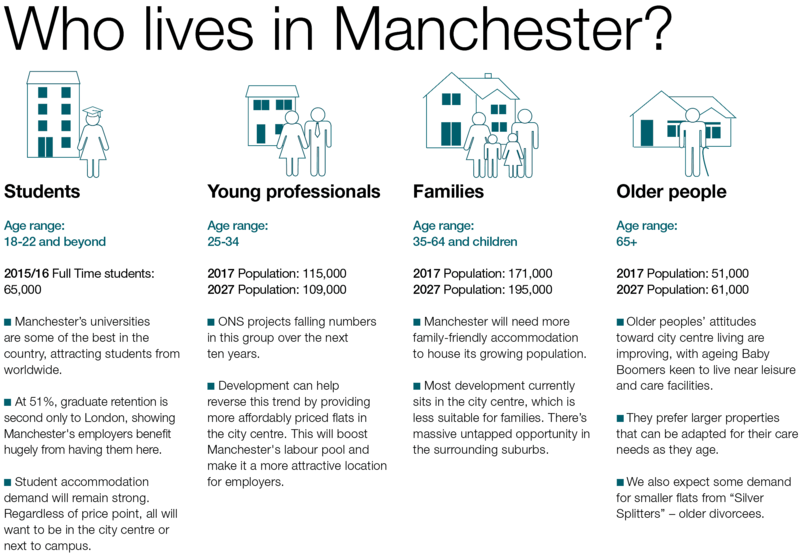 The number of people in Manchester aged over 65 is set to grow twice as fast as the total population over the next ten years, hitting 61,000 by 2027. We have observed a trend of older people moving back to cities to live closer to leisure, healthcare, and shopping facilities. Building homes that allow these people to age comfortably in place will free up family homes in the suburbs and could help reduce the strain on social care services. While the total volume of supply should be no cause for concern, the price point it’s aimed at might be. Housing in Manchester as a whole is relatively affordable, new build values in the city centre are out of reach for many aspiring first time buyers. Average new build values in the city centre currently sit at around £375 psf and there are examples of the £500 psf threshold being broken in prime locations. Those residential developments at the very top end of the market are competing for a smaller pool of occupier demand so developers looking to build in Manchester are likely to find a richer seam of opportunities in the mainstream market going forward. Already we have seen increasing activity from professional build to rent operators such as L&G, La Salle and M&G, who have substantially widened their geographical focus beyond the capital. 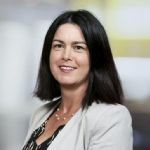 Faced with more competition this is likely to mean buy to let landlords will either have to step up the quality of their offering or, where they are heavily geared, look at exiting the sector. Overall, however, this should increase the range of housing options to younger households who are critical to Manchester’s economic future. 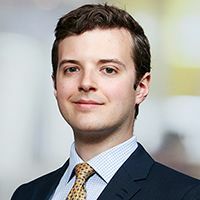 Legal & General’s new Slate Yard scheme, next to Spinningfields, demonstrates that the dominant occupier groups for city centre build to rent are students and young professionals – 80% of occupiers are under the age of 35, 50% under 25. Rents include high speed Wi-Fi, security, car club membership, and 24/7 concierge, with no fees and the option to bring your pets. From March 2018, residents will also have access to a gym included in their rent. Though young professionals make up a large proportion of residents, the sectors they work in are incredibly broad. No single sector makes up more than 12% of residents, with people working in sectors as diverse as education, healthcare, television, public services, and construction. Over a quarter of people living at the Slate Yard are full time students, around half of whom are post-graduates. 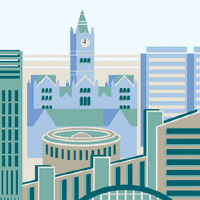 For those residents moving to Manchester from other university towns, having internet, concierge and a car club all included in the rent makes getting settled into life in the city substantially easier. Aside from students and young professionals, the Slate Yard is home to people from six months to seventy years of age. The diversity of residents demonstrates that this kind of product appeals to people from all parts of society, and is a valuable addition to Manchester’s housing stock.